Hortus Camdenensis | Ixia polystachya L.
Cormous peennial with narrow linear to lance-shaped leaves and spikes of few to many lightly fragrant, white, mauve or blue flowers, often with contrasting centres. To 90cm. [RHSE, CECB]. Grey comments that ‘Ixia erecta is a name promiscuously applied to many species. The species figured in Curtis’s Botanical Magazine appears to be identical to Baker’s I. polystachya.’ This is presumably the plant with white flowers figured as Ixia erecta, synonym I. polystachya. ‘Is one of the oldest inhabitants of its family in our greenhouses; cultivated by Miller together with Ixia flexuosa in 1757; propagates most abundantly, requiring little or no care.’ [BM t.623/1803]. Andrews' Botanical Repository figures Gladiolus polystachius, probably synonymous with Ixia polystachya, reporting that it first flowered with the Duke of Portland in 1797. [ABR pl.66/1799]. This journal also figured Ixia polystachya var. incarnata, with flesh-coloured flowers, introduced about 1795 by J. Pringle and distributed by Lee and Kennedy. [ABR pl.128/1800]. 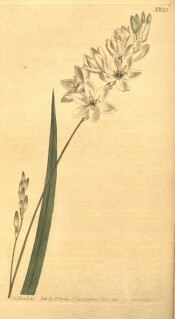 What may be considered the type Ixia polystachya, with white flowers, was also figured. This plant was reportedly introduced by Miller in 1757. [ABR pl.155/1801]. First recorded in an Addendum to the 1843 catalogue and in all subsequent editions [B.275/1843]. Ixia erecta maculata is listed in Loddiges’ 1836 catalogue and marked with a ‘c’ in the copy held at Camden Park. This suggests that a form with spots or marks on the petals was grown in the gardens by at least 1843, probably earlier. Ixia polystachya is quite common in old cemeteries in northern and Central Victoria. [Garry Reid, personal communication]. See also Ixia odorata Ker-Gawl., another possible identification for Macarthur’s Ixia erecta. More details about Ixia polystachya L.